In August 2014, South Lakeland Carers Association took a group of young carers on a residential break thanks to a £1,000 grant from Cumbria Community Foundation’s Fryer Grassroots Grants Fund. The group of 12 Junior Young Carers, aged 8-12 years old stayed at Isthmus Cottage in Keswick for three days. 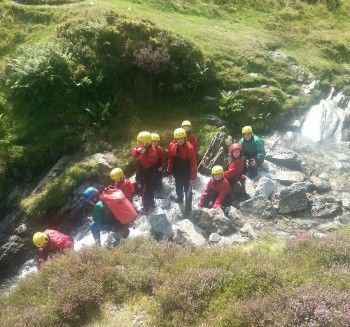 The group undertook a full day of activities at Newlands Adventure Centre; including high ropes and ghyll scrambling. They also took part in a Treasure Hunt around Keswick and visited water slides at the edge of Derwentwater. Benita Finch, Operations Manager at South Lakeland Carers Association said: “The trip enabled Young Carers to have a break from their caring roles, to learn new skills and gave them an opportunity to meet other Young Carers. One 9-year-old carer who attended the trip is the subject of a Child Protection plan and didn’t know any of the other Young Carers he was with. Benita said: “at the end of the holiday he didn’t want to go home and said it was the best time he’d ever had. To find out more about the Fryer Grassroots Grant Fund visit the fund page or contact our Grants and Donor Services Officer, Ellen Clements by phone (01900 825760) or by email.